Continuing its consumer recruitment and loyalty strategy, Pink Lady® is maintaining its premium positioning and offering a range of packaging tailored to local events and holidays throughout the year, to build closer relationships with customers and partner stores. To build and strengthen awareness of Pink Lady® in Europe and, more specifically, on emerging markets, the brand is making a splash by developing a range of new, customised packaging. These limited editions are a great opportunity to drive attachment to the brand and encourage consumers to choose Pink Lady®. The idea? To generate a buzz around the range through exclusive designs tailored to seasonal highlights in each country, such as Christmas, Valentine’s Day and Carnival, and bring these events to life in the fresh-produce section at supermarkets – a feast for the eyes and the taste buds! This promotional campaign also brings partner retailers strong added value. Indeed, these new designs will help to create new highlights for Pink Lady® and PinKids® throughout the season between September and April, and thus spice up the fruit-and-vegetable section, which often lacks innovation. Finally, Pink Lady® plans to co-design exclusive packaging along with retailers, enabling them to stand out from the competition and boost shopper loyalty – a win-win strategy and a great way to drive sales for Pink Lady®, which aims to reach 275,000 tonnes sold in Europe by 2025. “As a premium apple, we have to propose new ideas, and our partners really appreciate innovation, particularly in an aisle that is struggling to become more dynamic,” says Loïc Sidot, Trade Marketing Manager for Pink Lady® Europe. “Customisation is a key trend today, and sprucing up standard promotional offers like price discounts and prize-in-pack deals with tailored operations also helps us to strengthen the Pink Lady® brand on local markets,” added Sidot. Like it did with Valentine’s Day, the brand will be at the forefront during three new periods every year, with punchy, elegant, natural flair: back-to-school with PinKids®, the Christmas and New Year’s season, and the beginning of spring. With packs decorated for national holidays and festivities, Pink Lady® is adding new appeal for consumers throughout Europe during major celebrations. This means that we will find punnets decked out in the colours of St Patrick’s Day in Ireland, vibrant, festive packs to celebrate Carnival in Germany, elegant designs for Christmas, flowery patterns for springtime, and a host of other unique creations illustrating the brand’s values, which you can discover during the next season. This new packaging will be available in four-, six- and eight-fruit packs, as well as 2kg bulk trays, and, as required, may include exclusive new goodies. 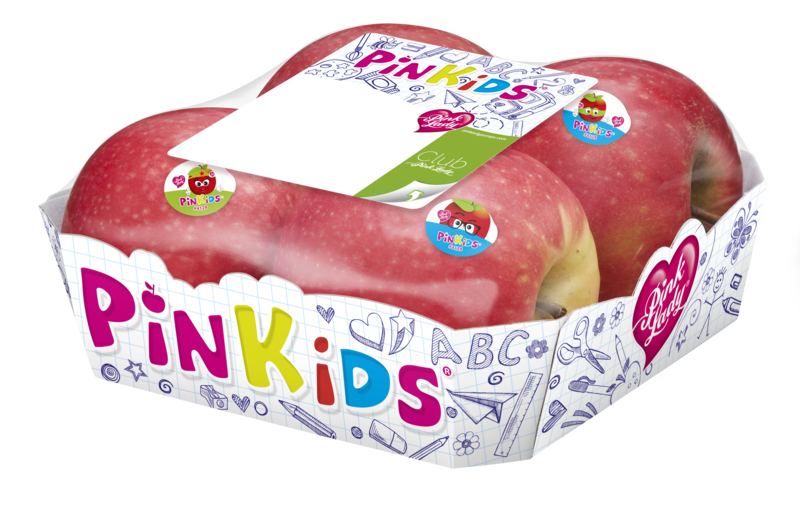 The first operation will highlight PinKids®, the small Pink Lady® apple for kids, which heads back to the classroom at the end of August with two new designs inspired by the back-to-school season. The first version shows the traditional classroom chalkboard, and the second features a page from a child’s notebook, scribbled with small drawings, and retailers are in on the fun as well: the campaign will run in five countries (Ireland, Germany, France, Belgium and the Netherlands), with marketing tailored to each. At Intermarché Belgium, for example, the drive will include an online quiz for children, with over 100 jars of spreads awarded to lucky winners! With an aim of 275,000 tonnes sold by 2025, Pink Lady® plans to maintain its leadership on the European apple market, thanks to its key strengths over the past 20 years: sharing and innovation.